At ScoreVision, we understand that many schools struggle with dwindling budgets for athletics and other activities, and the importance of generating advertising revenue is at an all-time high. In the past, the standard routine for advertising in school gymnasiums was to mount static, printed banners on the wall surrounding the scoreboard. Not only did the approach clutter the gym and confuse the audience, it stagnated to a point where the audience became numb to the messages and brands being showcased. Not any more. ScoreVision provides dynamic, digital advertising via eye-catching, multimedia displays and our Fan App, allowing you to declutter your gym’s walls and engage advertisers in brand-new ways! Check out some of the ways you can use your ScoreVision system to monetize sporting events and more! Sponsors can deliver a true sales pitch to their audience with effective messaging relevant to their current marketing campaign or sales efforts. In addition to tailoring the message on the ad, the sponsor can also change out their ad on a regularly-scheduled basis, showing certain ads during certain sports, periods, seasons, or other intervals. They no longer are stuck with a banner that remains stagnant all season long—they can swap out their messaging as promotions, seasons, and audiences change. ScoreVision LED jumbotron scoreboards incorporate multiple types of ads directly into the scoreboard and game-time experience, like panorama ads, brand wrappers, cinema ads, Fan App exposure, and more. Learn more about these types of ads in our post here. 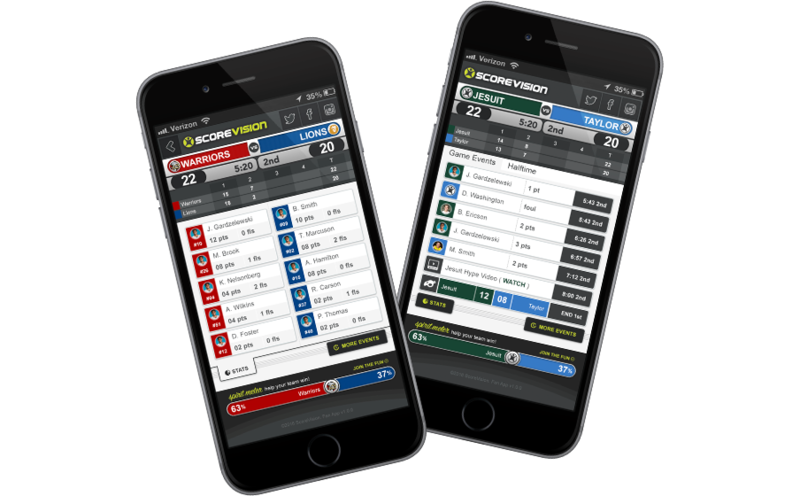 Engage fans even if they aren’t at the game with the ScoreVision Fan App. Ads like the ones shown on your ScoreVision multimedia display are also delivered through the fan engagement app when fans are checking scores, game stats, and leaderboards. This increases your sponsors’ reach to even more people. Take an idea from Chris Harper, Dean of Advancement at Grace Prep in Arlington, TX - he hosts themed nights presented by a title sponsor. Harper designed a larger sponsorship package that highlighted the sponsor’s logo in a quick email blast to the school before the game, featured the sponsor’s logo and messaging on the LED jumbotron scoreboard during the game, and allowed the sponsor to pass out small branded items to fans at the game. This gave the sponsor multiple types of exposure to a large, engaged audience, which increased size of the sponsorship package. Generate additional revenue by selling space in the announcer scripts for popular athletic events. Incorporate brand messaging into announcer scripts during breaks and countdown periods. For example, one advertiser could sponsor timeouts, one could sponsor halftime, and one could be the overarching sponsor of the whole night. These scripts are easy to implement and you can promote multiple advertisers by adding this exposure to sponsorship packages. Incorporate additional exposure for the advertiser and generate even more revenue by allowing the advertiser to provide branded items such as t-shirts, notepads, sunglasses, lip balms, or other small, inexpensive items. Cheerleaders or student volunteers can pass these items out during a game to give fans a collegiate-level experience and create lasting exposure for advertisers during and after the sporting event. For more tips on generating revenue with a ScoreVision jumbotron scoreboard system, check out these 6 simple steps from Grace Prep, who generated $480,000 in revenue with ScoreVision.